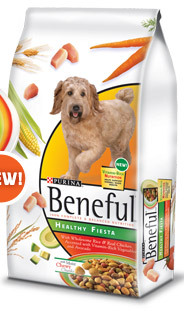 Our friends over at Beneful recently launched two new dog food products — Healthy Fiesta and Hearty Roasters. Healthy Fiesta, is a dry dog food that offers a blend of real and wholesome ingredients and Hearty Roasters is an expansion of Beneful’s wet dog food line, Beneful Prepared Meals, and is available in three flavors: Savory Turkey, Savory Pork and Savory Beef. Beneful Healthy Fiesta is a blend of real, wholesome ingredients that includes real chicken and rice, accented with hints of avocado, to promote healthy skin, as well as carrots and tomatoes to help support vision and a healthy immune system. It comes in a variety of crunchy and moist pieces. Beneful Healthy Fiesta is available in 3.5 lb, 7 lb, 15.5 lb and 31.1 lb packages that have suggested retail prices ranging from $5.99 for the 3.5 lb to $29.99 for the 31.1 lb packages. Their new Hearty Roasters contain chunks of real meat or poultry, tender veggies and wholesome grains, and are available in three varieties: Savory Turkey Recipe with green beans, brown rice and potatoes; Savory Pork Recipe with green beans, rice and sweet potatoes; and Savory Beef Recipe with green beans, carrots and barley. Beneful Prepared Meals Hearty Roasters are available in a 10 ounce re-sealable plastic container with a suggested retail price of $1.86 – $1.99. Both products will be available by mid-July 2011 in stores, but Beneful was nice enough to give one of our readers the opportunity to win a free sample, and is the first in our Summer giveaway-a-week series that lasts until Labor Day! Here are the details: Continental U.S. only and please leave a way to contact you. The giveaway closes Fri. July 29 at midnight, Eastern. Since it’s summer, leave a comment below telling us what your favorite summertime activity is to do with your dog. * Like My Tail Hurts From Wagging So Much on Facebook, and leave a comment below telling us. * Follow us publicly on Google Friend Connect, and leave a comment below telling us. * Follow us on Twitter — @Toby_Pup — and leave a comment below telling us. * Tweet about our giveaway using @Toby_Pup and “Beneful’s New Dog Food” in your tweet, and leave a comment below telling us. PS- After you enter the giveaway, check out our post last month about the amazing dream dog park they built near Atlanta. It is pretty awesome! Previous Post Summer Giveaways – Christmas in August! I like to take my dog to the Dog's Beach. He likes it there. Our favorite activity is to go to the lake! It was a blessing we were able to do so given the heat wave last week. There is nothing better! Tiger and I enjoy the river, especially on these super hot days we're having in Arkansas! My dog and I like to go to Yappy Hour which benefits a different rescue group every month. They have special treats for dogs and their humans, its alot of fun to meet other dog lovers. I Like My Tail Hurts From Wagging So Much on Facebook, as Kelly Ann T.
Our favorite summertime activity is LONG hikes along the Hudson River, where he usually goes for a dip! –Gina and Skunky. My favorite activity to do with my four pugs is to take them to the beach and let them play in the sand. They are too scared to go in the water, but they love to just run all the beach and scare the birds, lol. I also like taking them to this park where in has a big lake and these ducks and swan gooses. They love scaring them too! I am so glad to find this giveaway. I hope to win because right now my family is in such a struggle financially we couldn't even afford $15 to get our 19 year old pug his medication which we were 5 days behind in. Someone was so kind to lend us $15 so we can finally get his medicine. We always put are dogs before ourselves and we are finding ourselves behind in all of our bills, to the point we are all stressed out, extremely nervous and depressed. We are so used to helping others and giving, begging is something we not used to. We are scared, and lost. My family has became soulless and more like miserable zombies because of this economy. This economy has put us in so many difficult situations and have restricted us from getting many things our dogs need, which has made me even more depressed. I am especially stressed out about my 19 year old pug, Mugsy. I am an only child and as an only child I was lonely, especially since my father was always working. When I turned 5 years old, I was blessed with Mugsy. He completely changed my life from that moment on. He cheered me up and made me feel like I was not alone. I can not count how many times he has brought a smile to my face or made me laugh. I am 24 years old now and he continues to make me smile. I want to make sure I make Mugsy smile just as much as he makes me smile. I want him to be happy and live the rest of his life happy and comfortable. I love Mugsy so so so much, it kills me inside to know that we can not afford his medication or even a dog bed for him. We try to make him comfortable with blankets and pillows but he ends up losing his balance or a pillow slips from under him or the blanket does not support him well and he ends up falling to his side and flopping like a fish. He sleeps in my room at night on a blanket, because I fear he would fall of my bed when I am a sleep. His blanket is by my door. I woke up to him flopping and banging against my door, because he fell over again and couldn't get up. He was banging against my door so hard it sounded like someone was slamming a cannon against my dog. I had to hold him and cradle him the rest of the night. I wish someone would be so kind and help us with an orthopedic dog bed and anything else to help him with his severe arthritis and hip dysplasia. He cannot even hold himself up to drink water from his dish and I have to hold him up while he drinks water. Everyday from February until today, I have been contacting companies, non-profit organizations, churches, humane society, salvation army, you name it, asking for some sort of assistance, donation, or help, to just get no response or "no" as an answer. Some just tell me to go to non-profit organizations or to go somewhere else. I have been pointed in so many directions I probably made 1,000,000 circles by now. I even enter contests in hope to have some luck one day. I find myself losing hope and becoming more depressed. I don;t want anything for myself, I want to help my four pugs, especially my Mugsy. I won;t be able to live with myself if something happens to my Mugsy or my other pugs. I can't sleep anymore, that is how sad I am and when I do go sleep, I end up crying myself to sleep. I wish someone would help us and anything they need I will do to show my appreciation. My family will too. I just hope someone can help, please. Congrats, Gena! You are our winner! It's great to hear that this new dog product contains chunks of real meat or poultry, tender veggies and wholesome grains. My dog will definitely love this. On food, this is really something I'd like you to discuss with the dog's veterinarian because the sister dog does have a medical issue. I can tell you that I have had this issue with my own dog. He has allergies and has been on a variety of specialty foods over the years, not all of them very appealing to him, and we have had food strikes.